Jack’s quest to find the Threads of Time so that he can rewind the Rope of Eons continues in this issue in quite an unexpected manner. He was told that he had to find every single Thread before the Rope could be completed. At the end of the first issue, he had found his first Thread, which will lead him to the others. And that’s what happens here. After continuing to walk the dystopian cursed future where the Demon Wizard Aku is supreme, the Thread leads him to the location of the next Thread, but as before, Jack has a fight on his hands since the owners of the Threads are inimical to him. Jim Zub mixes the comedy with the action really well once again. Jack’s enemies are caricatures but there is an inherent threat and sense of danger in them. This means that despite all the comedic dialogue, they are opponents who are more than a match for Jack. In this particular instance, they are both twins and they have perfect synchronicity with each other so that even someone like Jack, who has successfully fought off multiple opponents before, is stumped and fails the first time around. There’s also some comedic commentary from the locals as well, which does much to add colour to the story in that its not all just about Jack going up against the Twins. Its all the little touches like this that make a Samurai Jack story so good. In the first issue, it was all on the enemies that Jack faces, but this time it is spread out among the characters. And at no point does the story ever get boring because Jim maintains a damn good pace for a story that is, essentially, divided into two parts. He balances everything really well and gives the reader some really good heart-pumping moments to get invested in. Once again, I have to say that his story here is very much true to the spirit of the animated series, for which this is a tie-in. 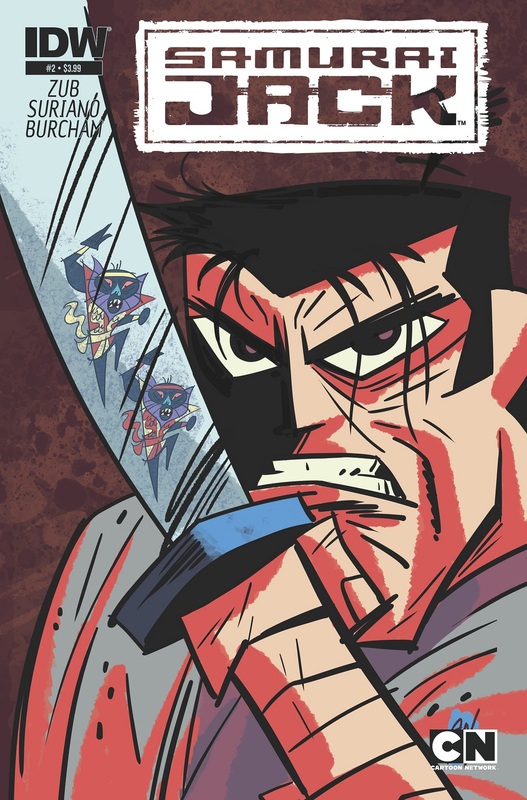 IDW has a history of putting out such tie-ins and in Jim and Andy’s Samurai Jack, they have another big success on their hands, that’s for sure. In a slight departure from the previous issue, Andy is joined by Josh Burcham, who handles the colours while the former continues with the internal pencilwork. Andy’s character work is once again excellent since he is able to capture the exact feel of the animated series. Its the same Jack that I remember. And Josh’s colours make this the same animated series that I remember since it gives off that same vibe and atmosphere, which is important for a tie-in property, quite so. However, the colours are a just a tad too dark and not as… bright, if that makes sense. Sort of a minor lack of polish, but otherwise good. But, this book looks authentic and in the end, that’s all that I really care about. The way that Jim tells the story, I can’t help but feel that there is a big confrontation incoming between Jack and Aku. In any sword and sorcery story, there’s always a big bad boss, and for Samurai Jack, that’s Aku. In fact, there’s a cover for an upcoming issue that shows Aku very prominently so I’m really hoping that we get to see him soon. I’d love to see the big bad boss because Aku is a fun character that you have no choice but to love. Posted on November 20, 2013, in Comics Reviews, Review Central and tagged Andy Suriano, Animated Series, Cartoon Network, Cartoons, Comic, Comics Review, Demon Aku, Fantasy, Genndy Tartakovsky, IDW Publishing, Jim Zub, Josh Burcham, magic, Review, Review Central, Samurai, Samurai Jack, Sword and Sorcery, Techno-Fantasy, Techno-sorcery, Time Travel. Bookmark the permalink. 15 Comments.